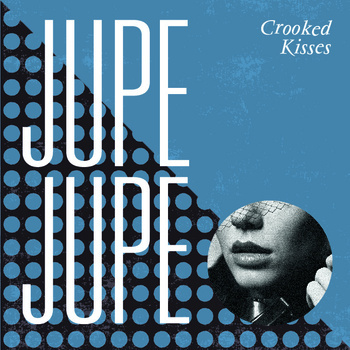 Despite its melancholy – even creepy – subject matter, Crooked Kisses, the third album from the Seattle quartet, Jupe Jupe, is filled with life-affirming choruses and hummable reverb-drenched guitar riffs. The rhythm chugs along, building against a backdrop of synths and big drums, and vocalist My Young‘s gentle croon. If the record was just a collection of retro synth-pop like the opener, “Pieces of You,” it would be well worth the listen, but there are clever twists throughout. The shimmery guitar line in “Whispers Kill” plays on the “everyone’s a spy” line to slyly incorporate some 1960s spy movie soundtrack and surf sounds. And although things never get too heavy, tracks like “Autumn October” and “Darkness” add a sharper, rock edge that keeps the band from sounding too much like its 80s New Wave influences. While the entire album is solid, “Love to Watch You Fall” and “All the Things We Made” have the group firing on all cylinders: the dark lyrics, stellar melodies, and layered instrumentation against a solid classic dance beat.